The Charles River is an important resource in Boston for many reasons. This collection of maps was designed to help people to learn about the relationship of people to the river, past and current. This map shows resources along the river that are useful to people interested in fishing in the Charles. The article at this website has very detailed information about each section of the river and what kinds of fish can be caught there. It also gives a good summary of the history of fishing in the Charles, which would help any reader understand the impact that pollution had on the Charles and the effort it took to clean it up. This map shows the route of a cruise that gives visitors a great view of historic and modern buildings from the Charles River and the Boston Harbor. Tourists and other people interested in history and architecture would enjoy this experience. Most people take tours on land, on buses or on foot so this tour would give them a way to enjoy the river and see a new view of the Boston landmarks. This map provides information about recreational boating opportunities on the Charles. There are a number of different places to rent equipment. By canoeing and kayaking on the river, people can appreciate the natural environment around the water, including wildlife and plants. Boating is good exercise and can be relaxing also. This historic map shows unidentified residences, public owned land, marsh areas, businesses, schools, cemeteries, bridges, railroads, canals, U.S. Arsenal and playing fields. It is interesting to use this map to imagine how the land around the river has changed over the past century. This website shows a series of flood maps for three time frames: 2013, 2030 and 2070. 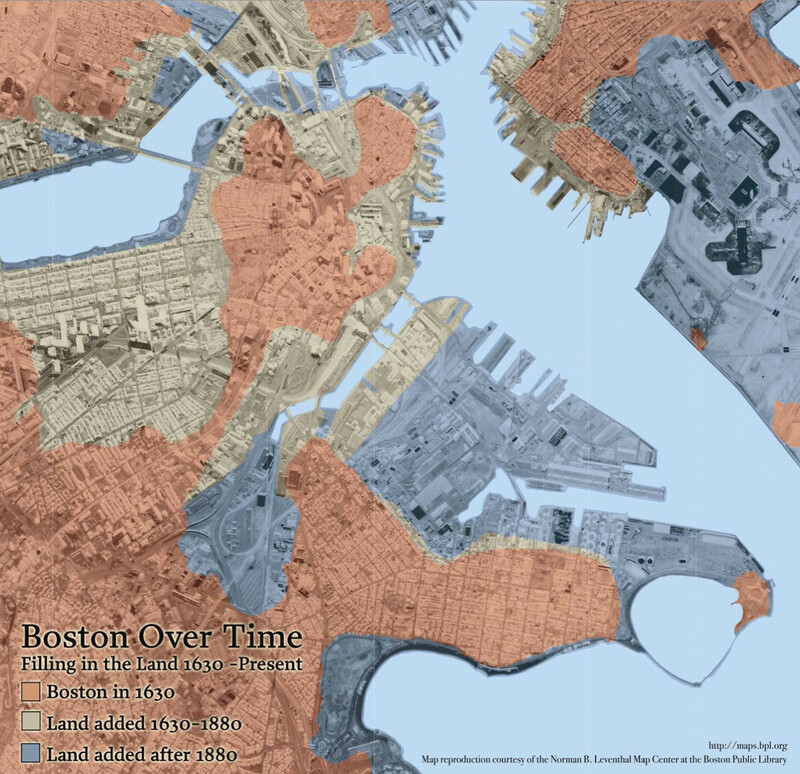 These maps are important to help people understand the predictions of changes in sea level and how Boston may be affected in the future. This map from the Norman B. Leventhal Map Center at the Boston Public Library shows how the river was filled in to make the landscape we know today. It helps people appreciate the large impact that humans have had on the river ecosystem.